Based on my travels to England, the answer is undoubtedly a big plate of fish and chips drizzled in malt vinegar — exactly the aromas that storm your nostrils upon stepping into Shakespeare Pub & Grille on India Street. As for those two-toned pints of beer that give you dark roasted-tasting Guinness on top (the black) and amber Bass ale on the bottom (the tan), they’re among several single-glass combination drinks that cost a buck less during weekday happy hour. Those, as well as any draught beer, are regularly priced at $7.50 for imperial pints (20 ounces) and $6.50 for American pints (16 ounces). 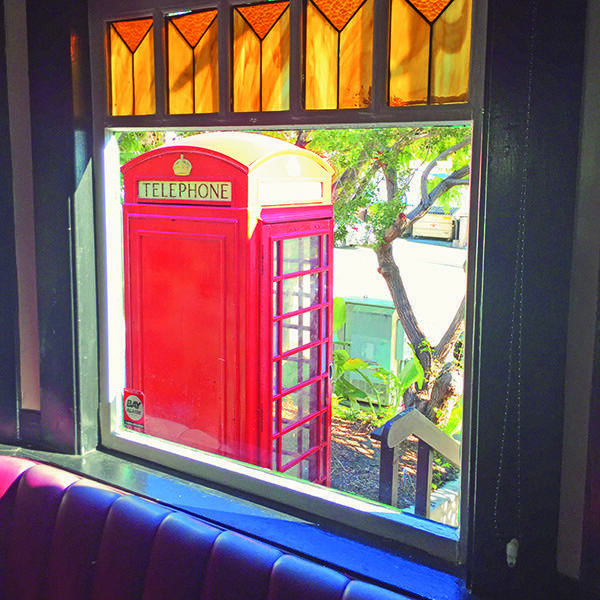 The long-established business is a magnet for United Kingdom transplants and Anglophiles seeking the closest experience to an English pub that sunny San Diego can possibly offer. Erase the surrounding palm trees, Interstate-5 and nearby El Indio Mexican Restaurant, and it’s easy to imagine that some charming cobblestone street lined with iron street lamps led you here. 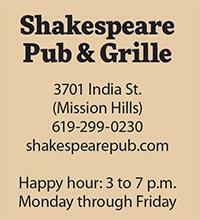 Shakespeare’s large outdoor patio might also seem antithetical to Britain’s pub scene. But the interior features enough dark wood, old-style windows and heavy ceiling beams to send you vicariously across the pond. There’s even an old red telephone booth on the grounds. 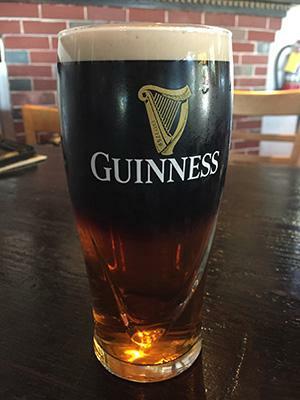 Based on a few happy hour visits over the past several months, the Black and Tan has been my preferred drink, although I’ve also thrown down imperial pints of Boddingtons (aka The Cream of Manchester) and a couple of “snakebites,” which combine Harp Lager with hard cider. Those sneak up on you slyly. Six different noshes are currently discounted during this time such as sweet potato fries ($5.95); beer-battered chicken wings ($6.95); and “proper chips” loaded with cheese, bacon and sour cream ($7.95). 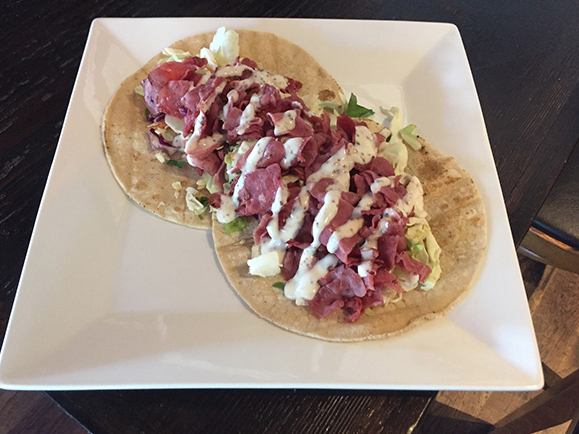 Most recently I chose a pair of corned beef tacos ($6.50), which didn’t taste as sacrilege as I expected. 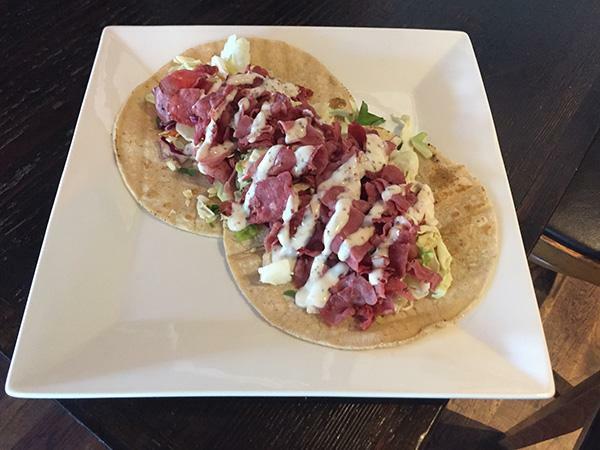 The diced, tender corned beef, crispy cabbage and silky mustard sauce seemed a natural fit for the corn tortillas. Though if you’re willing to veer off the happy hour menu and spend $16.50 for the fish and chips, you’ll score a big, long piece of substantially breaded Atlantic cod served with a piling of thick-cut fries and a side of canned green peas, which I hated as a child and still do. 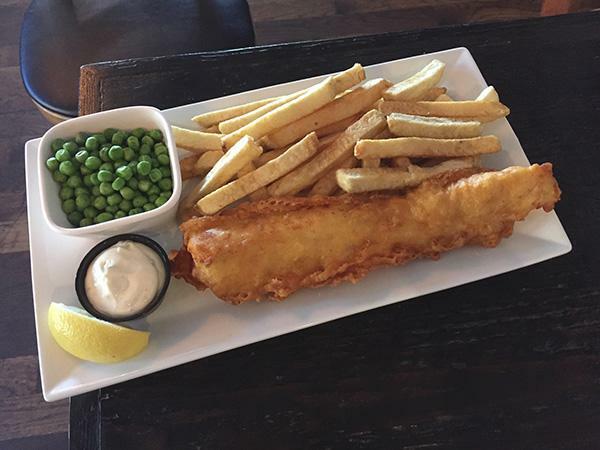 But it’s a satisfying beer-friendly meal that was voted in 2017 by the makers of Old Speckled Hen ale as being “the best fish and chips in the country.” Chef Tom Beatty, a friendly Irish chap, said he goes through nearly a dozen 45-pound cases of the fish a week, not to mention 1,000 pounds of Kennebec potatoes in the same period. The pub also hosts wine- and beer-pairing dinners, music trivia nights and broadcasts of international soccer matches. Details on these events can be found online.